Some of the Best spices and most unique blends. We are dedicated to procuring the world’s best spices and blends. We’re constantly traveling far and wide to meet and learn from producers, locals and chefs and to establish with them sustainable partnerships that are fair and rewarding to all. 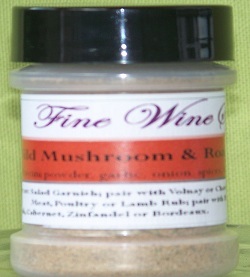 Meat, Poultry or Lamb Rub; pair with Pinot Noir, Shiraz, Syrah, Cabernet, Zinfandel or Bordeaux.